Jean-Dominique Senard: "The potential for growth is much larger in China than it is in Europe and North America." Michelin will counter rising pressure from fast-growing low-cost Chinese brands in Europe and North America by increasing the number of cheaper tires it offers from budget subbrands such as Tigar, Kleber and Riken. The French company, which ranks as the world’s No. 2 tire maker, also aims to double its revenues in China in the next 10 years. 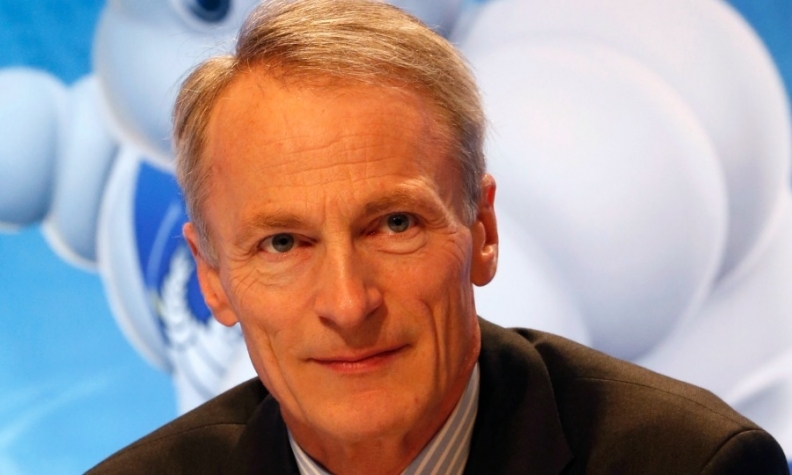 Michelin CEO Jean-Dominique Senard discussed both topics with Automotive News Europe Correspondent Nick Gibbs. Michelin is under pressure from Chinese tire makers in mature markets. What has been the effect in Europe and North America? The pressure is not in every segment and not in every country, but it’s there. For example, in the passenger car business the import of Chinese tires into North America this year has been tremendous. There are also Chinese imports into South America and Europe, perhaps less so [than in North America], but it’s not negligible. This tends to have an impact on the price structure of the tire business. At the same time, we are not playing on the same field. We are a premium company more than anything else. While we are clearly present in the [lower price brackets], we need to be there more than we are today without being in direct competition with these tires. MAIN CHALLENGE: To rapidly grow business in China while countering rising demand for Chinese tires in mature markets such as Europe and North America. What percentage of your tire sales is in those lower tiers now and what is the target? Today, it’s roughly 15 to 20 percent, it should probably move up to 25 to 30 percent in the next five to 10 years. We used to be big in these areas, but our recent strategy has been to make sure that we do not produce tires that destroy value. You were selling them too cheap? Yes, and we were producing them in areas where the cost base was too high. We had to dramatically restructure our business so we would stop bleeding cash and profit in Europe and in North America. We need to be there because our customers want Michelin Group tires but not necessarily all the performance of premium tires. Also, our distribution centers cannot live on just premium tires. They have to fill the racks with other brands, so if we don’t offer these tires [under Michelin subbrands] they will go to the competition. We can now manufacture these tires profitably and still offer good performance and safety. We will not sell non-premium tires under the Michelin brand. Do you foresee more people buying premium tires in Europe? People will buy larger tires and wider tires. This aspect has been improving for years. You don’t increase the number of tires, you increase the quality of the mix. How much will this improve? We see it increasing by a few percent every year. You want to double business in China over the next 10 years. What percentage of your business comes from China now and what could it be? We do not typically disclose sales by region, but today our business in China is 1 billion to 1.5 billion euros, so it’s not a huge part of the group [which had total sales of 20.2 billion euros on 2013], but it’s growing significantly. Could it become your No. 1 market? It would take some time. We are strong in Europe and North America but in the next five to 10 years China could certainly get to North American and European levels. The potential for growth is much larger in China than it is in Europe and North America as both could be flattish over the next 10 years for the domestic automotive and tire businesses. 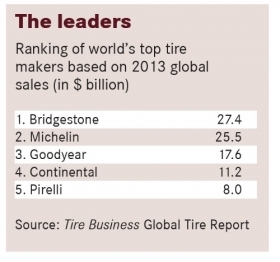 Is it your goal to pass Bridgestone to become the world’s No. 1 tire maker? I’m not sure it’s the best goal to have in mind. We are a big player, and we are probably No. 1 or No. 2 depending on how you count things. Growth is at the center of our strategy, but it’s not our target to be No. 1 for the sake of being No 1. I’d rather be No. 1 in technology and sustainable mobility.